The New York Times has a story today on the subject of treehouses, and it's accompanied by some pretty spectacular pictures. Almost makes me wish I lived in the countryside . . . almost. 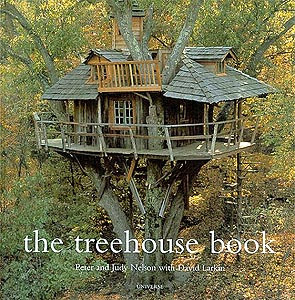 Most treehouses are follies, but there are people who live in their treehouses year-round. Among them are the Korowai tribe of Papua, New Guinea, who are said to be the last people to practice cannibalism. (Those particularly interested in cannibalism can read more about the Korowai in this Smithsonian article.) 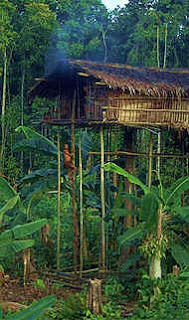 The tribe builds its houses high above the jungle floor--some more than 150 feet off the ground--and its members share their living space with their dogs, pigs, and kids. Back in the US, motorists can visit the "World Famous Treehouse" in Leggett, California. Built into the stump of a still-growing giant redwood, the treehouse holds the world record for tallest room. See a panorama of the treehouse here. that is so cool!!!!!!!!! but how much r they?